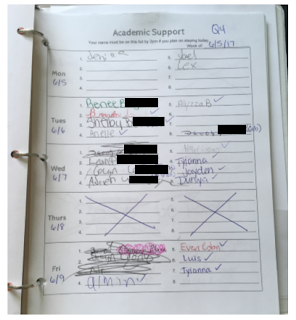 Part organization and part classroom management, this #SundayFunday post explores how I maintain attendance records for students attending after school academic support. I am typically with students every day after school. Some are there for Academic Support in math, while a few just need a quiet place to do homework, and others are waiting for their friends, for rides home, or for practice to start. Then one day I had half of the boys basketball team hanging around in my room before their game. Another day, I had twice as many kids in my room who were not even my students as ones who were currently part of my class rosters. And it got to be too much. I was regularly ending up with an "afterschool class" that was as big as my actual classes! I ended up doing way too much classroom management and not giving nearly enough support to the students who were truly there (whether by choice or by assignment) to work on math. 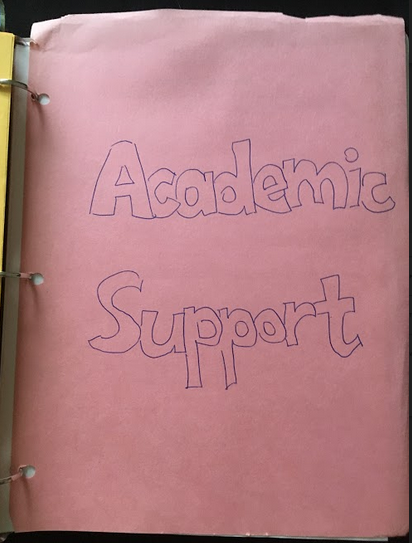 My solution: create an Academic Support sign-up sheet to (a) limit the number of students I had after school each day, and (b) help me keep track of whether or not students who were assigned Academic Support were actually attending. This sign-up sheet served its purposes! Here's how. First of all, there are only 8 spaces to sign up on any given day and I made it clear that if a student's name was not on the list, then that student would not be allowed in my classroom after school that day, even if they were assigned Academic Support. I also emphasized that if a student writes their name on the list, I expect them to be in my room after school because they are potentially taking the place of a student who was unable to sign up due to the 8-name limit. If a student did not attend as scheduled, I wrote myself a note and made a point to talk to the student the next day to find out why. 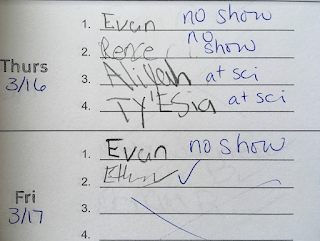 Additionally, I required students to write their names if they were going to stay after school before the end of the school day. This minimized the number of students who would just "drop by" at the end of the day to wait for their friends or because they didn't feel like going home yet. Certain students are assigned Academic Support according to school policy (failing average, missing assignments, etc.). 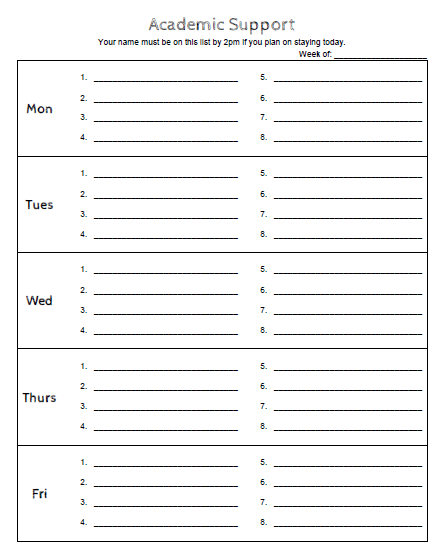 These sign-up sheets served as my attendance record for any given week. I also created an unweighted "assignment" in my digital gradebook where I recorded the date and time during which a student stayed for Academic Support with a brief note of what they worked on. Students who were assigned Academic Support either earned "100" for attending or "0" for not attending, while the rest of the students were excused from the assignment. Students and parents were able to access this record and my notes with the rest of the student's actual course grades. Because the assignment was unweighted, it did not calculate into the students' averages, but kids always felt good about seeing "100" when they attended (or panicked when they saw the "0" for not attending). Finally, I keep the previous weeks' sign-up sheets in my binder of Parent Contact sheets. Besides standard contact information likes names, phone numbers, and emails, my Parent Contact sheets include a checklist of scenarios in which a parent wants to hear from me about their student. One of those is a request to be notified when their child attends Academic Support. I section the binder by class period and organize the contact sheets alphabetically by student. 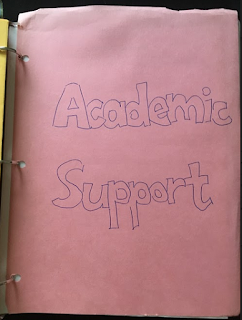 The last section of the binder contains all the Academic Support sign-up sheets from previous weeks with Q1, Q2, Q3, or Q4 written in the top right-hand corner for easy viewing if I ever need to go back and verify that a student did or did not attend Academic Support on a given day. Having the Parent Contact sheets and the Academic Support sign-up sheets in one place is super helpful when I need to check which parents requested a note confirming that their child attended Academic Support or when I need to reach out to a parent about their student's habitual nonattendance. This sign-up sheet was a life-saver for me! On Friday afternoons, I file the current week's sheet in my binder and take out a new sheet for the following week (I keep extra copies in the back pocket of the binder). All I do is write the dates and cross off any day that I am not able to have kids stay after school, and voila! A piece of tape and it's posted on my classroom door for easy access Monday morning when my students get their Academic Support notification! UPDATE: The Parent Contact Preferences sheet (modeled after this one from @mathequalslove) is also available through the link below. Great idea! Since I see grades 6-8 I plan to add a column for students to identify the learning target or concept. That way I'm better prepared and the student can articulate their learning need. I like that this places more responsibility on the student to be prepared as well and not just show up because they're "supposed to."